Ron Hutchcraft shares from his heart to yours, through A Word With You. Think of it as a daily audio blog. Ron�s stories and Biblical insights will transform the hearts and lives of your listeners. 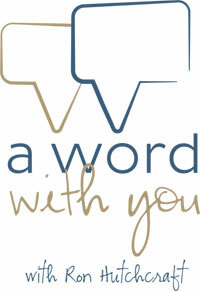 The goal of "A Word With You" is to share the Good News of Jesus with those who do not have a personal relationship with Him and challenge believers to make the greatest possible difference with the rest of their lives. We pray that you will use Ron's short, motivating, and inspiring program "A Word With You" to minister to your listeners' real life issues. Ron Hutchcraft is an author, speaker, radio host, and contemporary evangelist. As President of Ron Hutchcraft Ministries, Inc., Ron and his team produce radio programs, provide outreach and mobilization websites, conduct ongoing ministry outreach to Native Americans, and facilitate city-wide evangelistic events. Ron frequently speaks at the Billy Graham Evangelistic Association pre-Crusade youth events and Schools of Evangelism. Ron Hutchcraft is committed to communicating the Gospel of Jesus Christ to the lost in their language and to motivating and equipping believers to communicate Christ to the lost in their world. In all he does, he seeks to reach the lost and the young with the life-changing message of Jesus Christ. A veteran of over 43 years of youth and family work, Mr. Hutchcraft has presented the Gospel across North America and around the world. Through city-wide evangelistic outreach events called "Community Impact Weeks," Ron presents Christ to various people groups through parenting seminars, singles' events, youth outreaches, and business/professional dinners. Mr. Hutchcraft is also involved in ongoing ministry outreach to and with Native Americans, and is founder of the "On Eagles' Wings" Native ministry. He has also spoken at NFL and Major League Baseball chapels. Mr. Hutchcraft also has an Internet website outreach (www.hutchcraft.com). Through this website, many people worldwide come to Christ on a weekly basis. Mr. Hutchcraft was also honored as Moody Bible Institute's Alumnus of the Year for 1997. 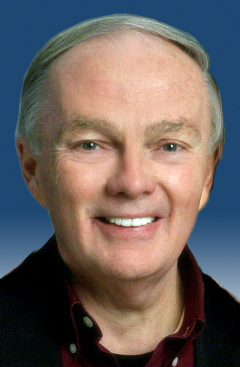 Ron Hutchcraft served as the Chairman of the 1991 Northern New Jersey Billy Graham Crusade, and also serves as a visiting faculty member of the Billy Graham Schools of Evangelism. He frequently is a featured speaker at Billy Graham Evangelistic Association pre-Crusade youth events and pastor gatherings. Mr. Hutchcraft's closest partner in ministry was his wife, Karen. They are grateful to God that their three children and spouses all serve in full-time evangelism ministry. Ron and Karen also have seven grandchildren. Ron's passion is to see lost people find Christ. He says, "I believe that never before have people been so ready for Jesus. My burden is that we, as His followers, are ready to reach them." After submitting your info above, you will immediately be prompted to download the radio programs for A WORD WITH YOU.